Dwellings of African people and a kindergarten for African children in Tel Aviv were firebombed late Thursday night as Israelis celebrated their Independence Day. From Wikipedia: "A pogrom is a form of violent riot, a mob attack directed against a minority group, and characterized by killings and destruction of their homes and properties, businesses, and religious centers. It originally and still typically refers to 19th- and 20th-century attacks on Jews, particularly in the Russian Empire." As no deaths were reported to have resulted from the firebombing, it would be inaccurate to refer to the incident as a 'pogrom'. However, the campaign conducted in recent years by Israeli political and religious officials to dehumanize and persecute non-Jewish African people provides ideological support for attacks like these, and for potentially worse attacks in the future. In January, I authored a video report about state-sponsored racial discrimination against non-Jewish African people in Israel. The report was submitted by the African Refugee Development Center in Israel to the United Nations Committee on the Elimination of Racial Discrimination. In response to this and other reports, the United Nations urged Israel "to amend the Law to Prevent Infiltration and any other legislation aimed at discriminating against asylum-seekers or denying refugees, on the basis of their national origin, the protection guaranteed under the 1951 Geneva Convention relating to the Status of Refugees". It also expressed concern over "the recent increase in racist and xenophobic acts, manifestations and discourse, especially against... asylum-seekers of African origin", and great preoccupation with "the unavailability of precise data on complaints, investigations, indictments and prosecutions against politicians, public officials and religious leaders involved in such manifestations and discourse". Since the United Nations issued its report, Israel has not scaled back its campaign of dehumanization and persecution against non-Jewish African people; in fact, it has continued unabated. In February, a Tel Aviv City Counsellor proposed that non-Jewish African people be forced to ride on separate buses from Jewish people. Also in February, the mayor of the city of Ashkelon (twinned with Baltimore, Maryland and Portland, Oregon) declared that non-Jewish African people cannot live wherever they want to in the city, and restricted their movements to one particular area of the city where police can monitor their activities. In April, Israeli media outlets reported that Tel Aviv City Council had considered hiring armed mercenaries to ethnically cleanse south Tel Aviv of non-Jewish African people. At a public conference sponsored by the city of Ramle on April 15 to discuss non-Jewish migration to Israel, several members of Knesset representing various political parties spoke openly of the mere presence of non-Jewish African people in Israel as constituting grave danger. I attended the conference and live-tweeted on location. Israel's Interior Minister Eli Yishai, who is among the most vocal and most active in the campaign to dehumanize and persecute non-Jewish African people in Israel, also spoke at the Ramle Conference. Another featured speaker at the conference was Qiryat Arba Rabbi Dov Lior, one of hundreds of Israel chief rabbis on the public payroll who decreed in December 2010 that it is forbidden for Jewish people to sell or even rent apartments anywhere in Israel to non-Jewish people, including non-Jewish Africans. Rabbi Dov Lior recalls passage from Torah which warns of dangers of NOT ethnically cleansing Land of Israel, basis of the "rabbis' letter"
On Wednesday night, as street parties in celebration of Israel's Independence Day took place throughout the country, activists reported that Israeli security services swept through a south Tel Aviv neighborhood with a high concentration of non-Jewish African people and forced them all indoors, using billy clubs and tasers. The security forces did not molest other people milling about the neighborhood. Police clearing NeveShaanan. Pman and 10 Magav soldiers swinging sticks, walkin in formation, going frm building 2 building & clear ppl out. #NeveShaanan :One officer pulled a tazer and shot it behind someone. they were breaking up parties & shaking people down. The holiday revelry continued throughout the country for the next twenty-four hours. 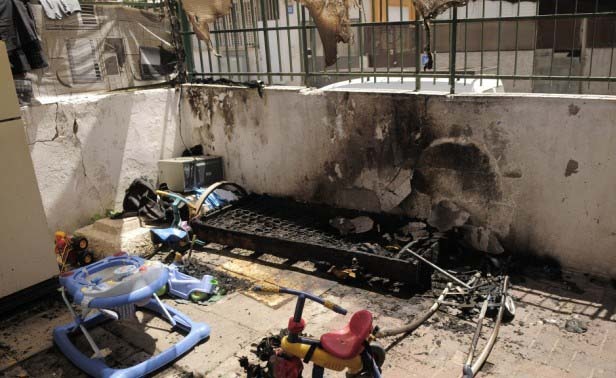 Late Thursday night, at about 1:00 AM, molotov cocktails were tossed into the dwellings of non-Jewish African people and a kindergarten for African children in south Tel Aviv. Hours later on Friday afternoon, activists converged on the south Tel Aviv neighborhood where the firebomb attacks had taken place and demonstrated in solidarity with non-Jewish African people and against racism. They were received by Jewish residents of the neighborhood with bitter anger. Signs condemning racism were snatched from the hands of activists and torn. Initially, the Tel Aviv Police did not consider the attacks important enough to inform the public about, even though it is standard procedure to do so in cases such as these. As of this writing, no Israeli media outlets have reported on the fact that only twenty-four hours prior to the firebomb attacks, Tel Aviv police clubbed and tazed non-Jewish African people off of the streets of the neighborhood. #ShapiraProtoPogrom was precipitated by @il_police flushing Africans put of NeveShaanan with billy clubs. Mainstream media yet to report it. Don't you think that physical containment of a group, just before a hate attack on members of that group, constitutes info worth reporting? An investigation into the causes that led to the Tel Aviv proto-pogrom must examine the campaign of dehumanization and persecution against non-Jewish African people by leading Israeli political and religious leaders in the years, months and weeks leading up to the attacks. But it must also examine the police action to violently clear the streets of non-Jewish African people without any cause the night before the attacks. If there were fewer non-Jewish African people walking about the streets of the neighborhood, because they were afraid of being violently accosted by the police without just cause, as they had been the night before, then the perpetrators of the firebomb attacks would have had an easier time carrying out their coordinated plan, with less danger of getting caught in the act. A thorough investigation into the Tel Aviv proto-pogrom must examine the extent of the connection between the violent police sweep in Tel Aviv and the subsequent firebomb attack against non-Jewish African people the very next night.